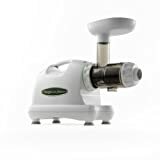 Juicer Deals 2013: Buy a Juicing Machine at 70% Discount or More! If that is indeed the case, then you are most certainly in luck because it seems those good people of amazon.com are looking to make your juicing dreams come true. That headline might sound a bit extravagant, my apologies for that, but I kid you not – there are juicer being offered for sale with such an incredible discount. We’re going to run through a few models for you, not all are quite so modestly priced but discounted still the same. Most of these machines are centrifugal and a lot of them would make for what we’d call good beginners juicers; not too expensive and not built to last you a lifetime but still good enough so that you can give juicing a try and see what it is all about! The 13454 BEC is a 600 watt centrifugal which is receiving mixed reviews from Amazon users but at a price below $40 it is perhaps worth the gamble? Buy 13454 BEC Juice Extractor at 70% off! Should you want to kick it up a notch, the Rosewill RHAJ-12001 packs a 700 watt motor but is still available for under $40! These are apparently going fast! Rosewill RHAJ-12001 Stainless Steel Fruit and Vegetable Juice Extractor – 60% off! As we confirm in our review the Waring Pro is decent extractor and most reviews on amazon are along similar lines. A steal at just over $50! Many people feel most comfortable buying brands that they recognize. 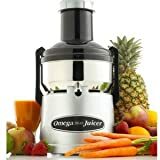 Omega is a tried and true juicer brand and this model is available for just 150 bucks. Get The Waring PCJ201 Citrus Juicer With 71% Discount! Should you be looking to add color to your countertop then check out this Cuisinart, over 60% off and available in 5 different colors. We’ll round off the list with a great masticator. The Omega machines are not cheap but as our detailed review points out, you know what you’re gonna get. Plus you can get a good discount! So we’ll round off this list we dubbed juicer deals 2013 and before I sign off, I’d like to add that I hope you find a juicer you like or even love. If none of these take your fancy then please browse our site, we have tons of reviews for you to check out and when you do get a juicer – be sure to check out our recipes!